Mikasa Shokudo on Hwy 58 in Matsuyama, Naha. If you were hungry in the middle of night, where would you like to go to eat? Convenience stores are open 24 hours a day, and sell some snack-style food, but few offer a table to eat, not to mention a full and hearty meal. Mikado Shokudo on Hwy 58 in Naha has been featured in a nationwide TV show. In Okinawa there are many ‘shokudou’ (restaurant) that are open around the clock and serve delicious and reasonably priced meals, but a few visitors or even foreigners who live here know about them. Here are a few. 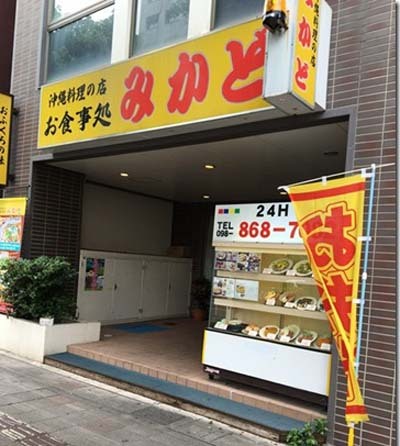 In Naha area, Yanbaru Shokudou has been in business since 1974. “Yanbaru” refers to the area in northern part of Okinawa, and as the name of this eatery, it is designed to give an impression of being a no-frills restaurant that serves healthy country-style food. Yambaru Shokudo has over 80 dishes to choose from but they don’t have menu books. 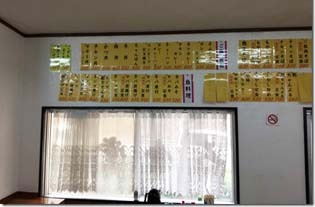 Instead, all meals are listed on the wall where customers can choose their pick. Amazingly waitresses don’t white down any notes when they take the order. They memorize everything, and never seem to make a mistake. Most shokudo have menus written on the wall. The place is very crowded especially at lunch and dinner times because there is a large high school and university just in front of the shokudou. Mikado Shokudou on Hwy 58 in Matsuyama is one of the best known 24-hour eateries on Okinawa as it has been featured in a Japanese TV show. They serve Okinawan foods and also Katsudon (pork cutlet on rice bowl) and Chanpon dishes for only ¥600 complete with rice and mixed fried vegetables. Mikasa Shokudou is located right next to Mikado Shokudou. Mikasa also serves mostly Okinawan fare. 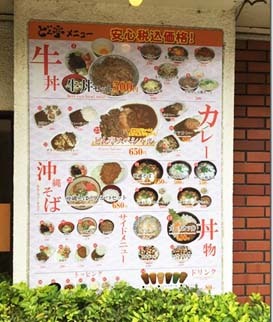 Some shokudou have their entire menu displayed on a banner outside by the entrance. Matsuyama area in Naha is know for having hundreds of bars and night clubs, and many people come down to the area on weekends. And after having their fun drinking and merrymaking, many of them like to eat Okinawan food before going home. Many of the staff of the bars and clubs also come to these shokudou after work. 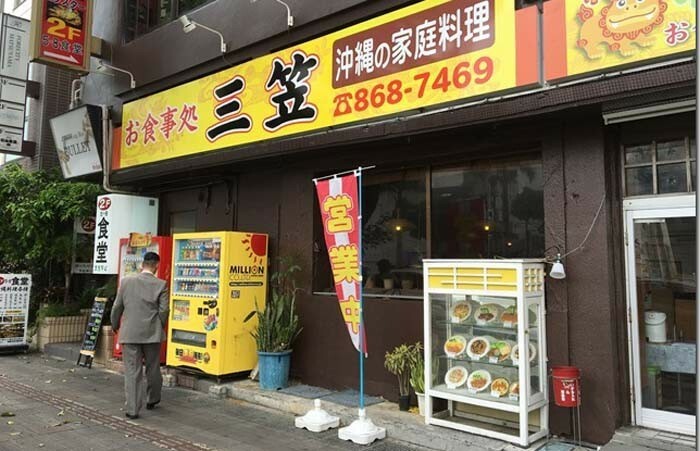 Other 24-hour restaurants in Naha include Ichigin Shokudou, and Highway Shokudou. Both feature Okinawan cuisine with local Okinawa atmosphere. Dontei has three branches in the Naha area. One is in Makishi , another on Kokusai Street, and the third in Nagata. All serve gyudon (beef on rice bowl), curry, Okinawa soba, and Katsudon (pork cutlet on rice bowl). The menu has many toppings for gyu-don to choose from, such as cheese, kimchi, and moyashi (bean sprouts). One can choose a curry dish with cheese, fried chicken, or pork cutlet. 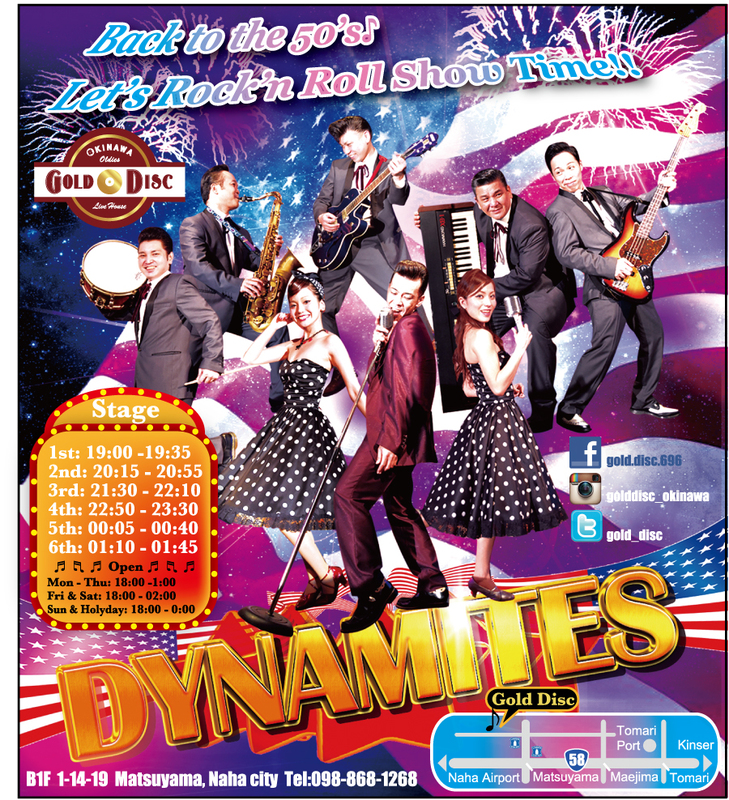 Okinawa City also has its 24-hour shokudou. Restaurant Kuni, located in Awase, Okinawa City, specializes in steaks. The meal comes with soup, salad, rice or bread and iced tea. Their menu also has lobster, taco rice, tacos, French fries and more.